We are making a dramatic change to our neighborhood: through a spectacular design plan that includes dynamic lights and video signage, elegant gateways and the world’s first and largest outdoor chandelier, we are bringing the historic beauty of our theaters outdoors for all to enjoy. Watch a video of the beginning of our transformation here. The centerpiece of the plan is the world’s largest permanent crystal chandelier in the style of grand chandeliers seen in Playhouse Square lobbies. The chandelier itself will be 20 feet in height and adorned with more than 4,200 crystals. Suspended from a 44-foot high steel structure, the chandelier will grace the intersection of E. 14th Street and Euclid Avenue. The perfect place for casual meetings, relaxation and entertainment, Star Plaza has been refreshed a stage for concerts, lectures and more; a new sound system; a cozy fire pit and a new dining experience by Cowell & Hubbard’s Zack Bruell. Dynomite features sandwiches, wine and beer. Four elegant gateways will define the Playhouse Square neighborhood, creating a feeling of anticipation as you arrive at a destination guaranteed to inspire. A retro “stick built” sign structure, featuring 9-foot letters and rising to a height of 40 feet will be erected on top of the buildings near the corner of E. 13th St. and Euclid Avenue, paying homage to Cleveland’s 1920s-era roots when Playhouse Square’s historic theaters were built. 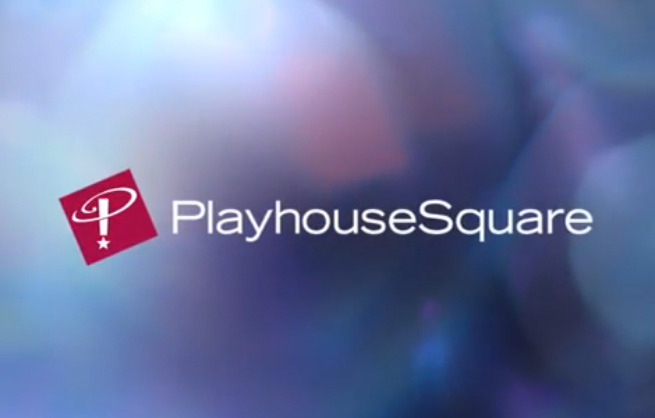 Existing Playhouse Square signage – the iconic vertical sign, marquees and news tickers – will be replaced with energy-efficient LED signage. In addition, key neighborhood buildings will receive “up-lighting” treatments to create a glowing nightly ambience and movement. A digital signage network will come to life both above and at pedestrian level to create movement, interaction with viewers, color and vibrancy throughout the neighborhood. Engaged users may see their own images, special messages and visual art as it is being created. Save the Date of May 2! We have set the date of May 2, 2014 for the lighting of the dramatic design features commissioned to bring the beauty of its historic theaters outdoors, creating an even more inviting and vibrant destination in the heart of downtown Cleveland. The May 2nd event will include a gala benefit and community celebration. “We hope everyone will plan to be part of the excitement on May 2,” said Playhouse Square President and CEO Art J. Falco, “While we are not yet ready to announce the evening’s details, I will say that it will be quite a special night for Northeast Ohio. You are going to want to be able to say you were there.” Click here to watch the video of the announcement made on Fox 8 News. On May 2, Playhouse Square will unveil the “GE Chandelier,” the world’s largest, permanent outdoor chandelier. This 20-foot tall chandelier, the most unique element of the Playhouse Square neighborhood transformation project, will grace the intersection of Euclid Avenue and East 14th Street. GE Lighting has become a major supporter of the project and exclusive sponsor of the chandelier. GE LED lighting solutions will be used in several transformation design elements: digital signage, gateways and building uplighting, as well as in the chandelier. “GE Lighting is proud to be the exclusive sponsor of Playhouse Square’s iconic chandelier and also play a significant role in lighting the theater district with innovative, energy-efficient LED lighting,” said Maryrose Sylvester, GE Lighting President and CEO. It’s official! We will attempt to break the Guinness World Record for largest outdoor chandelier. We will send in our evidence after the GE Chandelier is installed and anticipate a ruling by mid-summer. PlayhouseSquare has engaged Mark Cheplowitz of Wizard of Ahs as event director for the May 2 community celebration and unveiling. His impressive resume includes Superbowl half-time shows, college bowl games, a wide array of corporate events and the grand openings of the Great Lakes Science Center and Rock and Roll Hall of Fame and Museum. We feel fortunate that he is right here in Cleveland, and will share information about the plans he’s dreaming up for the big event soon. For all project updates, click here. Who else is talking about this project?